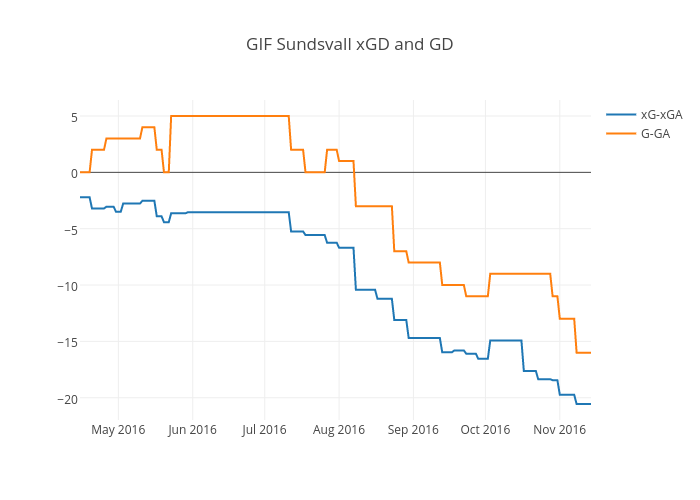 Giffarna started the season really well, winning lots of close games and actually also at one point, leading Allsvenskan. Their underlying numbers told another tale, something I tried to tell the ones making too much celebrations on Twitter in this blog post… When 8 rounds was played Sundsvall was still competing for medals, placed at position 3. Sundsvall remained on the top half of the table throughout the first half of the season but when I looked at how they actually were performing, I really thought that it seemed as if they got a lot of points from close games that could have gone either way. Something that supported my story was looking at xG. To visualize how teams perform I have started using an area chart that displays actual performance in the top two areas and underlying performance in xG – xGa terms below. The idea is to in this way easily visualize teams actual performance in regard to underlying performance. Sundsvall during this season exemplifies the idea quite well. This is how that visualization looked after 8 rounds. Sundsvall had over performed at both ends, scoring more goals than expected and conceding less. Now, in general that is something that tends to level out.. Almost halfway through the season Sundsvall remained in the top half of the table when I made my first projection for the season. When the autumn came, the over-performance leveled out and Sundsvall dropped trough the table. 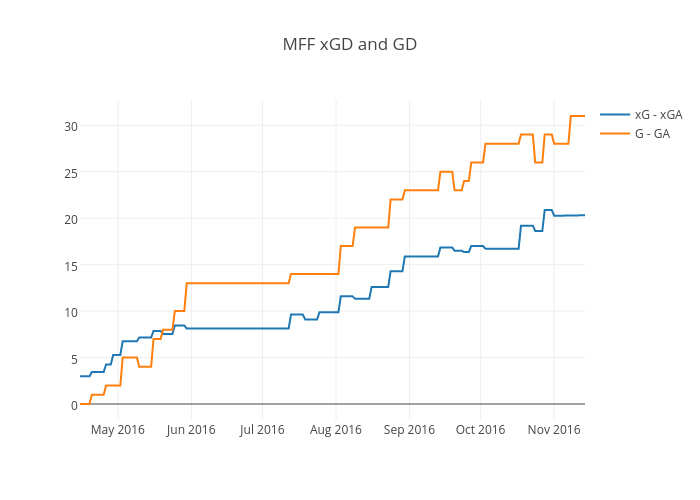 The following line plots shows the accumulated xG-xGA diff and G-GA diff for Sundsvall and MFF (to compare with) just to clearly visualize that Sundsvalls underlying performance regarding xG-xGA has remained to be negative more or less the whole season. The linearity is quite clear for both teams. Nothing to say there more than that they are worthy, and waited winners. The image of a winning team!